I hate HA (High Availability). Today everything has to be highly available. All of the sudden SA (Standard Availability) isn’t cutting it any more. Case in point: I used to listen to music on my way to work. Not any more – my morning meeting schedule intrudes into my ride, forcing me to participate in meetings while driving, Bluetooth and all. My 8 speaker, surround sound Acura ELS system hates me – built for high resolution multichannel reproduction, it is reduced to ‘Hi, who just joined?’ in glorious mono telephony. But I digress. You know that I wrote many articles on micro-services because it is our ongoing concern as we are slowly evolving our topology away from monolithic systems and towards micro-services. I have already written about my thoughts on now to scale and provide HA for Node.js services. We have also solved our problem of handling messaging in a cluster using AMQP worker queues. However, we are not done with HA. Message broker itself needs to be HA, and we only have one node. We are currently using RabbitMQ, and so far it has been rock solid, but we know that in a real-world system it is not a matter of ‘if’ but ‘when’ it will suffer a problem, bringing all the messaging capabilities of the system with it. Or we will mess around with the firewall rules and block access to it by accident. Hey, contractors rupture gas pipes and power cables by accident all the time. Don’t judge. RabbitMQ has an interesting feature in that nodes in the cluster can join in RAM mode or in disc mode. RAM nodes will replicate state only in memory, while in disc mode they will also write it to disc. While in theory it is enough to have only one of the nodes in the cluster use disc mode, performance gain of using RAM mode is not worth the risk (performance gain of RAM mode is restricted to joining queues and exchanges, not posting messages anyway). OK, we cluster the nodes and we are done, right? Not really. Here is the problem: if we configure the clients to connect to the first node and that node goes down, messaging is still lost. Why? Because RabbitMQ guys chose to not implement the load balancing part of clustering. The problem is that clients communicate with the broker using TCP protocol, and Swiss army knives of proxying/caching/balancing/floor waxing such as Apache or Nginx only reverse-proxy HTTP/S. After I wrote that, I Googled just in case and found Nginx TCP proxy module on GitHub. Perhaps you can get away with just Nginx if you use it already. If you use Apache, I could not find TCP proxy module for it. It it exists, let me know. What I DID find is that a more frequently used solution for this kind of a problem is HAProxy. This super solid and widely used proxy can be configured for Layer 4 (transport proxy), and works flawlessly with TCP. It is fairly easy to configure too: for TCP, you will need to configure the ‘defaults’, ‘frontend’ and ‘backend’ sections, or join both and just configure the ‘listen’ section (works great for TCP proxies). I don’t want to go into the details of configuring HAProxy for TCP – there are good blog posts on that topic. Suffice to say that you can configure a virtual broker address that all the clients can connect to as usual, and it will proxy to all the MQ nodes in the cluster. It is customary to add the ‘check’ instruction to the configuration to ensure HAProxy will check that nodes are alive before sending traffic to them. If one of the brokers goes down, all the message traffic will be routed to the surviving nodes. Do I really need HAProxy? 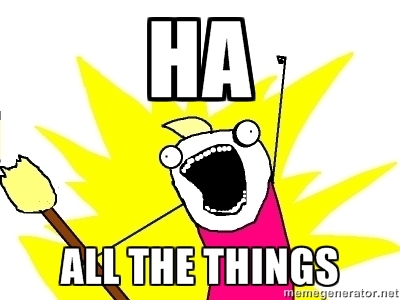 If you truly want to HA all the things, you need to now worry that you made the HAProxy a single point of failure. I told you, it never ends. The usual suggestions are to set up two instances, one standard and another backup for fail-over. This is not a utility where you run ../configure && make && make check && make install, put a few values in a *.conf file and you’re done. LVS rearranges the way IP works so that a router and server (here called director and realserver), reply to a client’s IP packets as if they were one machine. You will spend many days, weeks, months figuring out how it works. LVS is a lifestyle, not a utility. OK, so maybe not as perfect a fit as I thought. I don’t think I am ready for a LVS lifestyle. How about no proxy at all? Wouldn’t it be nice if we didn’t need the proxy at all? It turns out, we can pull that off, but it really depends on the protocol and client you are using. It turns out not all clients for all languages are the same. If you are using AMQP, you are in luck. The standard Java client provided by RabbitMQ can accept a server address array, going through the list of servers when connecting or reconnecting until one responds. This means that in the event of node failure, the client will reconnect to another node. We are using AMQP for our worker queue with Node.js, not Java, but the Node.js module we are using supports a similar feature. It can accept an array for the ‘host’ property (same port, user and password though). It will work with normal clustered installations, but the bummer is that you cannot install two instances on localhost to try the failure recovery out – you will need to use remote servers. On the MQTT side, Eclipse Paho Java client supports multiple server URLs as well. Unfortunately, our standard Node.js MQTT module currently only supports one server. I was assured code contributions will not be turned away. This solution is fairly attractive because it does not add any more moving parts to install and configure. The downside is that the clients becomes fully aware of all the broker nodes – we cannot just transparently add another node as we could in the case of the TCP load balancer. All the client must add it to the list of nodes to connect to for this addition to work. In effect, our code becomes aware of our infrastructure choices more than it should. All this may be unnecessary for you if you use AWS since Google claims AWS Elastic Load Balancing can serve as a TCP proxy. Not a solution for us IBMers of course, but it may work for you. This is getting pretty tiring – I wish we did all this in a PaaS like our own Bluemix so that it is all taken care of. IaaS gives you the freedom that can at times be very useful and allow you to do powerful customizations, but at other times makes you wish to get out of the infrastructure business altogether. I told you I hate HA. Now if you excuse me, I need to join another call.